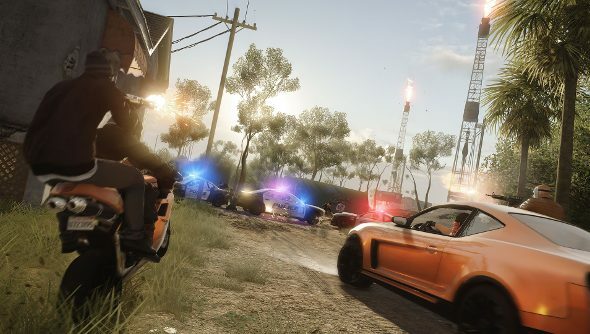 Visceral and EA have spilled the beans on Battlefield Hardline’s upcoming beta, which will be open to everyone, regardless of platforms or previous beta participation. The first beta, which popped into existence not long after the Battlefield spin-off was first announced, left a lot to be desired. It wasn’t going to be a reskin with cops and robbers, but that’s exactly what we got. Hopefully the game’s postponement has lead to it becoming a bit more distinct. The open beta will showcase two maps and modes, with classic 64-player Conquest along with the new mode, Hotwire, which combines lots of people shooting at each other with high-speed pursuits in cars. While the beta limits maps and modes, there won’t be a experience cap, so players will be able to unlock classes, weapons and gizmos to their heart’s content. “While it’s just a taste of the whole game, we want you to come in, take your jacket off, stay awhile,” says executive producer Steve Papoutsis. Hardline is due out in March, but EA is still yet to reveal the launch date for the beta.